Palo Alto, Shanghai, Singapore and Reading (UK) – Thursday, November 15 2018: Worldwide smart speaker shipments grew 137% year on year in Q3 2018 to reach 19.7 million units, up from 8.3 million in Q3 2017, and well in line with Canalys’ forecast of 75 million for the whole of 2018. Riding on the success of its Prime Day, Amazon shipped 6.3 million Echo smart speakers in Q3, reclaiming the top spot after two quarters of playing second fiddle to Google. This quarter, Google shipped 5.9 million units, putting it just behind Amazon. It made pre-emptive strikes by lowering prices of its Home speakers in anticipation of Prime Day, but the shopping festival proved highly beneficial to Amazon. The fight for dominance between Amazon and Google not only helped the US grow 30%, but also influenced other key markets, such as the UK, Canada and Australia. 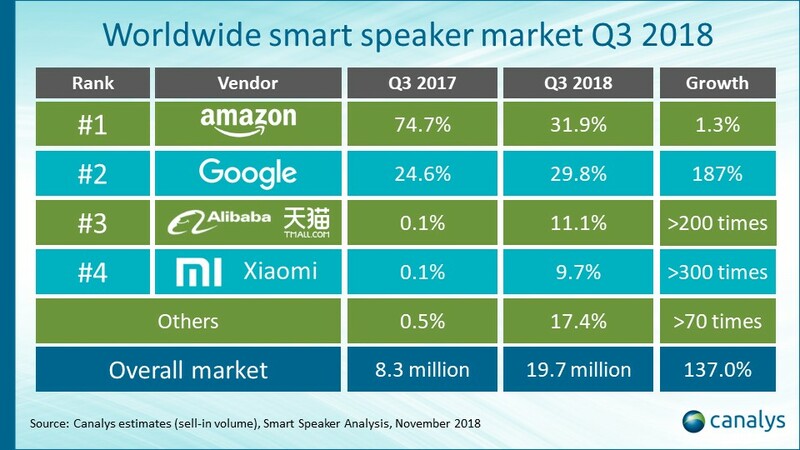 China, the world’s second largest smart speaker market, saw Baidu enter the market in Q3, and threaten to break the duopoly held by Alibaba and Xiaomi.Canalys previously reported that the Chinese market grew nearly 100 times to 5.8 million units. Alibaba retained its global ranking by shipping 2.2 million of its Tmall Genie speakers and came third overall. 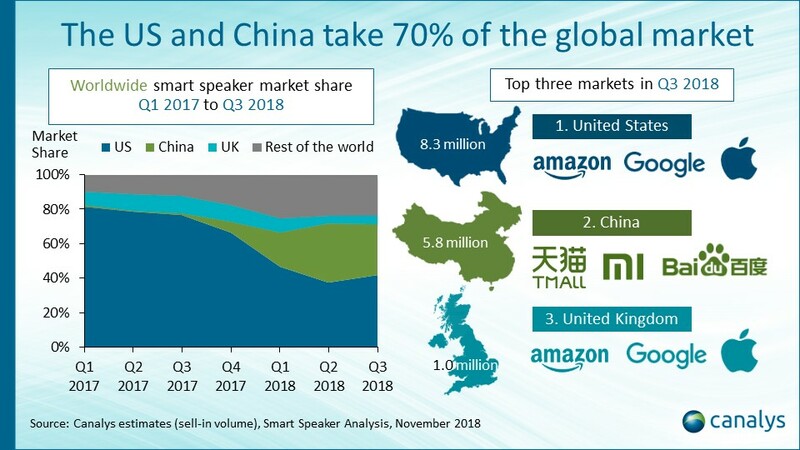 The UK overtook South Korea to become the third largest smart speaker market in Q3 with shipments reaching 1.0 million.